I just came back from a visit to Paicu, a small village in the south. 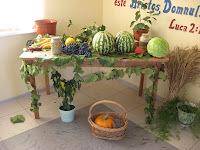 Every year they have a harvest festival and every year Tamara has invited me to come. This was the first time I was able to make it. 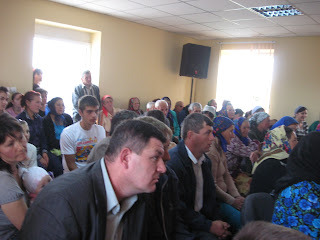 The young church invites the whole village to a thanksgiving service and then a harvest feast. 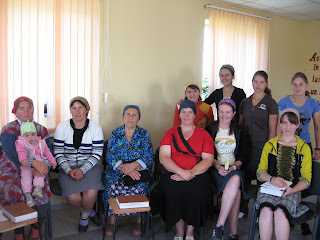 The women of the church worked all night the night before preparing all kinds of Moldovan delicacies - salads, potatoes & chicken, stuffed green peppers, clatite (a kind of crepe), wafer biscuits with honey - it was all lovely and delicious. Somebody in the village had donated grapes - lots and lots and lots of grapes - and I brought a big bag of leftover grapes home, as well as a bag of fresh tomatoes and a couple loaves of bread that weren't used. 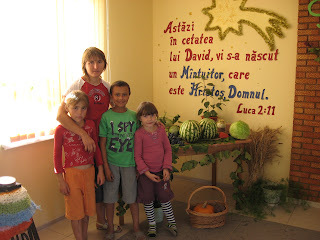 Harvest season in Moldova is really quite wonderful. On the way home today there were many roadside fruit vendors with watermelon, squash, grapes and tomatoes. Truly God is to be thanked for the abundance of the harvest. And at the same time as the village has shared the physical blessings of the harvest, they have planted the seeds of the gospel - generosity, compassion and caring, hope, the love of God, and the word of God. This morning as I led a Bible study on John 17 with the women of the church, I encouraged them to continue to do God's work of making Christ known, sharing His word, praying for those in their sphere of influence, and reflecting the glory of God in all that they do. On the way home today we saw this sight and it was too good not to share with you. I was glad that Kate was with me to jump out of the car and go running to snap this photo. The driver thought she was crazy: "My car broke down - what do you expect me to do!?!" 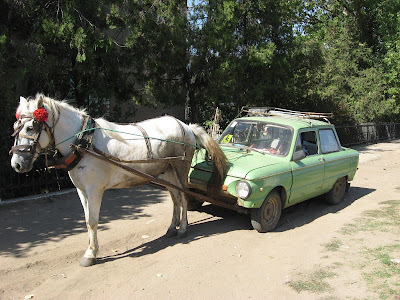 I never cease to be amazed at the ingenuity and practicality of Moldovans. See folks, I shouldn't be worrying about Rosie and whether she'll start or not - I should just get myself a horse! Posted by Barb at 5:35 p.m. I have come across your blog as I am looking for people to stay with as I travel through Eastern Europe in Jan/Feb 2009. I would love to stay with you for a few days and help out in whatever way possible! I am an Australian uni student, a committed Christian, and am passionate about the work your organization is doing in Eastern Europe. I was looking for your email on your blog here so I could send you a proper email, but can't find it...could you email me at master.globe@hotmail.com? Thanks so much Barb!